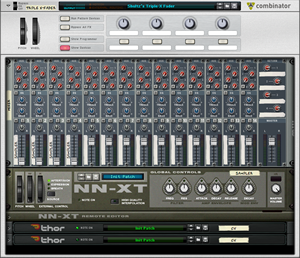 The virtual SSL Mixer in Propellerheads Reason is an amazing Mixing Console modeled after a SSL 9000k. 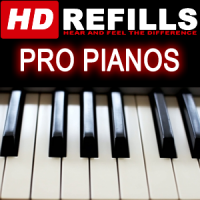 It has unlimited tracks or as many as your computer can handle and each track has a great sounding EQ section with high and low pass filters, high and low shelving filters as well as parametric midrange filters and a pop-up Spectrum EQ window that can be resized plus from this window you can choose any track and EQ it. For Dynamics each channel has a fully featured Compressor, Limiter, Gate, Expander. The Inserts are literally Combinators built right into the channel which give you amazing control of your insert effects like no other mixing console ever. How does 8 Send Effects per channel with unprecedented controls sound, plus Master and Channel level control along with Panning and Muting. The inputs of each channel have Input Gain, Inverse Phase and a numbers of ways to configure Insert/EQ/Dynamic routing. The Channel Fader gives you easy Grouping and Parallel processing which is a must on any pro level mixing console. Then all that’s left is the Master Buss channel with its crown jewel Master Buss Compressor and killer Control Room level, all mutes off, all solos off and -20db buttons. Add in some FX solo select buttons and a pop-up Master Buss Spectrum Analyzer and you have the best virtual Mixing Console on the market…IMHO. 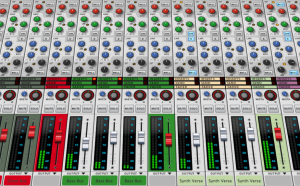 Here at LearnReason you will find the SSL Mixer Video Series which covers every section of this Mixing Console. You will find these tutorials easy to follow and understand. Matt speaks clear and makes it fun. 1000’s of people have watched this series and the feedback speaks their true thoughts of how it helped them and it is the driving force of LearnReason.com. There are 15 tutorial videos in this series and you can watch them all right here in HD. Click the playlist at the top left corner of the video to select a tutorial. What do you think of this series, have something to share, need help, please post it here.